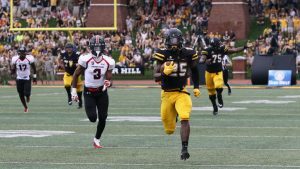 Gardner-Webb probably couldn’t have picked a worse time to roll into Kidd Brewer Stadium than Saturday afternoon as the opponent in Appalachian State’s hurricane-delayed, football home opener. Coming off a cancelled contest last weekend, when Southern Mississippi used every excuse necessary to back out of a scheduled non-conference encounter, the Mountaineers were firing on all cylinders as they overwhelmed their Football Championship Subdivision foe in a 72-7 mismatch. Special teams ace Steven Jones scored one touchdown and set up another with a team-record-tying, two blocked punts and tailback Jalin Moore powered for 119 yards and two TDs in the first quarter alone. Wide receiver Dominique Heath (four receptions for 111 yards) had a breakout performance with two scoring catches on the day and Zac Thomas continued his stellar play at quarterback with one TD through the air and one on the ground as Appalachian roared ahead 52-7 by halftime. The announced crowd of 21,804 might just get used to such scoring exploits for a Mountaineer squad (2-1) that has piled up 155 points (51-point average) in three non-conference games. Maybe Southern Mississippi was wise to bail out last weekend after all. It was a sentiment echoed by his players. It took ASU only three plays and one minute to grab a lead it wouldn’t relinquish. Thomas (11-of-15 for 185 yards) found Heath alone in the GWU secondary and hit the speedster in stride for a 64-yard TD strike. Just over two minutes later, Jones shot through the Bulldog line to block Crimmins Hankinson’s punt and recovered it in the end zone for a 14-0 lead. The punt blocks were the result of great preparation during the week and solid game-planning by special teams coach Stu Holt, Satterfield and his players said. “We knew if we could get them to do what we wanted them to do, we would get them,” Duck said. The lone highlight for Gardner-Webb occurred on the next possession when freshman QB Jordan Smith (13-of-27, 117 yards, two interceptions) executed a 11-play, 75-yard drive that ended with his 14-yard scoring connection to Jonathan Blackmon. But the Mountaineers rallied from that defensive lapse to steamroll the Bulldogs with 38 points the rest of the half. 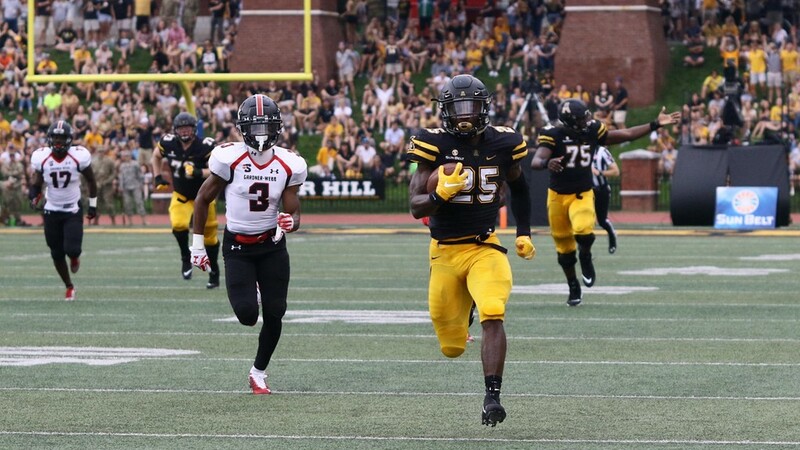 That surge included an 81-yard scoring scamper by Moore — the longest of his highly-decorated App State career — and Jones’ second blocked punt. Jones tied a record that was set three times previously, once by Dino Hackett in 1985 and twice by Chuck Hill in 1987 versus Liberty and Western Carolina. Hackett’s performance came in the incredible final game of his Mountaineer career when he resisted a school-standard 27 tackles against East Tennessee State. For the third game in a row, Appalachian scored off its special teams. Not only did Jones contribute to two touchdowns, but All-American candidate Clifton Duck contributed the Mountaineers’ second TD punt return of the season. Duck sliced and diced 62 yards for his first special-teams score. Thomas Hennigan had returned a punt 59 yards for a touchdown two weeks ago in the 45-9 win at UNC-Charlotte and Darrynton Evans raced for a 100-yard kickoff return score at Penn State. “We talked a lot about our team speed and thats where it really shows up, in our backups and our special teams,” Satterfield explained. Altogether, Appalachian had 84 players see action on Saturday. “We cleared our bench and played everybody in uniform who could play,” said Satterfield. That led to some remarkable performances by the Mountaineer reserves. Freshman D’Andre Hicks, a quarterback in high school, who is just learning the nuances of running back, came in during the second half and dashed for a game-high 150 yards rushing on only 11 carries, including a 73-yard scoring jaunt in the fourth quarter. Backup quarterback Peyton Derrick was a perfect 7-of-7 passing for 68 yards and one touchdown — a 19-yard connection with Heath — in relief of Thomas. Appalachian out-gained Gardner-Webb 692-160 in total yards and 809-167 in all-purpose yards. Appalachian will return to action at home next Saturday when it hosts South Alabama in its Sun Belt Conference opener at 3:30 p.m.
“It’s a big week for us next week,” Satterfield said.